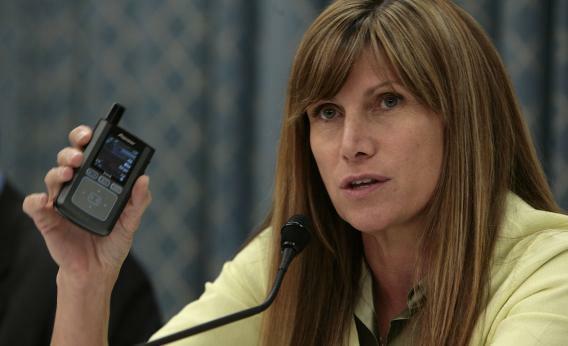 App economy: Mary Bono Mack holds congressional hearing on apps and job creation. Can the App Economy Cure Dismal Job Numbers? “This is shameless, really,” said Rep. Mary Bono Mack, R-Calif., on Wednesday, as she held out her iPad, showing high-resolution photo of her infant grandson to those gathered in the Rayburn hearing room. But this wasn’t just a grandmother showing off. Recently, the chairwoman of the House Subcommittee for Commerce, Manufacturing, and Trade said, she had been babysitting her grandson when he was struck in the middle of the night with “a crying fit. … So I did anything any good grandmother would do, and I went to the App Store and downloaded Baby Soother”—the app version of the Baby Einstein product created by New York-based app developer IntuApps. The eight-term congresswoman was trying to make the point that the average American has become so app-enabled that if we come across a problem, we expect to find an app solution. That’s an exaggeration—more than half of American adults don’t own a smartphone. Nevertheless, in just five years, mobile apps have become a $20 billion industry. The Apple Store has grown from 500 apps in 2008, the year it launched, to more than 600,000. One industry group reports that there were 11 billion downloads of apps in 2010 and anticipates that figure will grow to 77 billion by 2014—that’s more than 10 apps downloaded for every person alive on the planet today. The booming mobile app market has created roughly 466,000 jobs since 2007, according to a study released in February by TechNet. And the app industry says that there could be more—if Congress cooperates. That’s why, under the pressure of a dismal September jobs report and upcoming election, this hearing on the future of the “app economy” took place in the first week Congress was back in session. The four-member panel that testified before the subcommittee included representatives from small-business app-developers FastCustomer and Flurry Inc., plus and the tech industry trade associations TechNet and the Association for Competitive Technology. The figures they boasted were the stuff of political dreams: The apps industry is American born and bred. Seventy-eight percent of app companies are small businesses. Many are women-owned. U.S. app developers even command a 22 percent of Chinese app market revenues. Yet several potential snags loom. As developers continue innovating, their faster, stronger, and more productive apps will eat up bandwidth like it’s no joke. The faster 4G networks are creating a spectrum shortage, and industry heads are asking lawmakers to free up spectrum, most of which is government-owned. So in February Congress passed legislation allowing the FCC to hold spectrum auctions to free up both licensed and unlicensed spectrum for wireless broadband. The agency will meet on Sept. 28 to figure out exactly how to do this. An estimated 44,000 open developer jobs will have no impact on the unemployment rate if they go unfilled. In a survey conducted by app developer Flurry, more than three-fourths of respondents said they don’t think their companies can hire all of the software developers they need. And they’re not exactly looking to give positions to laid-off auto workers in Michigan. When asked during the hearing how his company recruits its employees, Peter Farago, VP of Flurry Inc., looked uncomfortable when he replied they usually hired the cream of crop from the Ivy League and top technical schools such as MIT and CalTech. Private mobile-app developers are looking to Congress to help address this human capital shortage, which Rey Ramsey, the CEO of TechNet, blames on “a string of policy problems tracing back to schools.” With the federal government struggling to staff its own technology workforce, this might be a tall order. After Bono Mack flashed her grandson’s photo for the world to see, Rep. Bill Cassidy, R-La., bought up the point of ownership. Does Bono Mack really own Baby Sonny’s photo? Or does the app company that she used to store it? And what prevented the company from stealing the photo and using it in something like a Gerber commercial? While Cassidy’s example was a little far-fetched (not to mention already illegal), the sentiment was spot-on. That very morning, Rep. Ed Markey, D-Mass., introduced the Mobile Device Privacy Act, which would require mobile companies or app developers to let consumers know in advance if their personal activity is being tracked, why it’s being tracked, and who is seeing it. Until now, the app industry has enjoyed relatively little regulation, allowing it to flourish—but also creating some disasters. Welcome to the Age of Transparency, App Economy.